In this post, I’ll talk about two of my favorite subjects: money and making a difference. More specifically, I’ll talk about making money and the unique role a CFO can play in creating financial health and wealth for business owners. So I will be speaking in this post to the portion of my audience who are CFOs and accounting professionals to encourage them to play a more strategic role in driving financial success in business. I will also be speaking to the portion of my audience that are entrepreneurs and CEOs. I will share with you my insight on the larger strategic value of a CFO when the time comes for you to pull the trigger and hire a full-time or outsource CFO. Think for just a minute about how perfectly positioned we are as CFOs to help a company win financially in business. By winning financially, I mean helping to create a company that is financially strong and that creates wealth for its owners. What we need to do is take our financial expertise and direct it toward playing a more strategic role in creating financial success for a company and its shareholders. There’s no one in the company better positioned than we are to bring order and structure to the complex process of creating true and lasting financial success in business. Here is an objective I encourage you to adopt in your role as CFO. I call it the big thank you. Thank you Philip. You helped me create a financial future for this business that is bigger and brighter than I could have ever imagined when you joined our team. That is what you want to hear from the entrepreneur or CEO of the company you work with. When you set an objective like that, it inspires you to reach down deep and work on really making a difference inside a company. It reminds you that helping a company succeed financially is also helping people succeed financially. It adds a sense of fun and adventure to the work we do every day as CFOs and accounting professionals. The mission in business is to create and have money. By “create and have money” I mean to make money and hang on to a portion of it. Or, to make money and create wealth. The key is to be very clear with yourself that the financial goal in business is to be profitable and to turn a portion of those profits into an ever growing net worth for the business and its owners. I recognize that not everyone is comfortable with my statement that the mission in business is to create and have money. Partly because most mission statements are intended to be more philosophical. And partly because most mission statements are really more about marketing because they are intended to be put in front of customers. So you can add the word “unstated” before “mission” to make it a little easier for you to digest and agree to. So you don’t need to put my version of your mission on your business card. But it is very important as the CFO that you focus very purposefully and consistently on the underlying importance of helping the company “create and have money”. 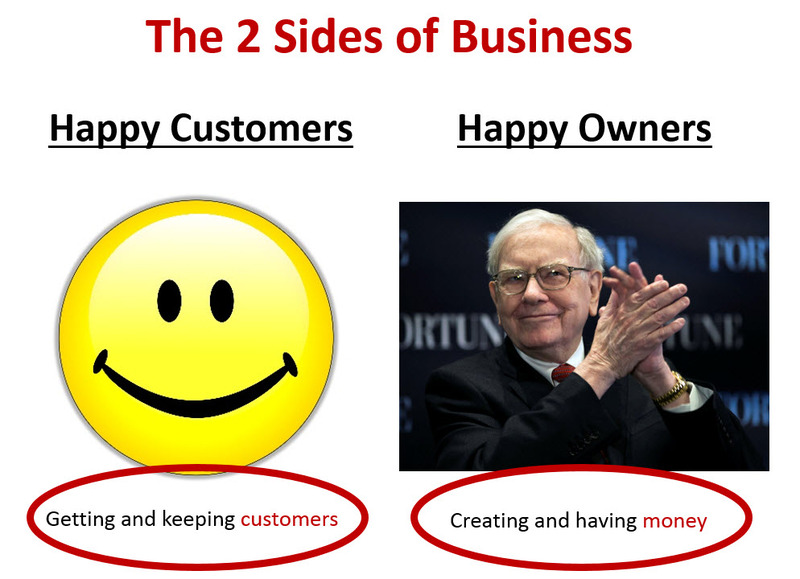 Here is another way to look at the two sides of money in business. This is a graphic I like to show entrepreneurs and CEOs to help paint the picture for them of the two sides of money: making money and creating value. We have to focus on profitability (on the left side of the graph) so we have the money to grow the business and ultimately return a portion of those profits to the owners of the business every year. We also have to focus on increasing the value of the business (on the right side of the graph) so the value of the company continues to go up. Financial success for the company and its owners requires both sides of the money equation to be healthy and growing over time. Think about buying the stock of a public company as an example. Let’s say I invest $10,000 in the stock of a company. I want to receive a return on that investment (generally in the form of dividends) every quarter. I also want to know that, over time, the value of the company is going up. Let’s say that ten years has gone by and I decide to sell my shares and I sell them for $100,000. I would have received dividends during those ten years as well as experiencing a nice increase in the value of the company when I sold my ownership interest. That same dynamic applies to every company. As the CFO, we want to focus on helping drive above average profitability and also create a strong return on investment for the company and its owners. I like to look at business as having two overriding goals. The first goal is to create happy customers. I call this part of business The Customer Factory. At the heart of a strong business model is being really good at getting and keeping customers… profitably. That is the primary role of the entrepreneur or CEO. A CFO can assist in many aspects of that process, but the CFO is not the person primarily charged with the all-important challenge of getting and keeping customers. The second goal is to create happy owners. This side of the business is about managing the complex relationship between profitability and the many different aspects of cash flow. 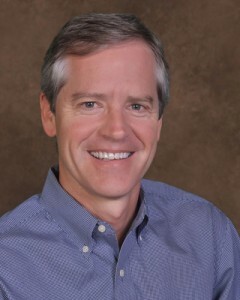 Then helping to mold the result into a strong net worth for both the business and its owners. This is where a strategically focused CFO shines. This part of the business is led by a CFO working closely with the CEO and the leadership team to help the company and its owners win financially. There is a reason so many businesses fail to achieve financial success. It’s because there are very real obstacles to overcome when it comes to creating above average profitability and growing the value of the business for owners. I put the obstacles in two buckets. In my 20+ years as a CFO, I have learned that the best way to overcome obstacles like these is to think SMALL. Think baby steps. No need to try to blow through every obstacle in one fell swoop. What you need is a plan, a financial road map, that is easy to follow and that can be implemented in a methodical, actionable way. A plan that fits perfectly into The Monthly Financial Rhythm of business. Here is an achievable, 3-Part Plan you can begin implementing today. You will be surprised and delighted at the speed with which you see results and feel the benefits as you begin implementing this plan. There’s no magic wand you can wave that will instantly create financial success in business. Winning financially in business is a journey. It’s about deciding what you are trying to create financially. Then implementing a plan to get you there safely and on time. This 3-Part, 10-Step Plan is a simple, step-by-step approach to creating financial health throughout the lifecycle of your business. It provides you a path to follow. 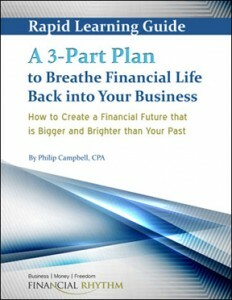 It provides the clarity of knowing what your next steps need to be on the road to financial improvement. It’s a “one foot in front of the other” approach to making your business financially strong. The road map will give you the confidence that comes from having a simple system to follow. It helps shift your focus to specific action items and away from the fuzziness that too often leads to struggle and confusion. My blog post, How to Breathe Financial Life Back into Your Business, describes the power of this financial road map and each of the 10 steps in the process. Read it real quick and see if it is the road map you are looking for. Here’s to financial health, wealth, and freedom in your business. 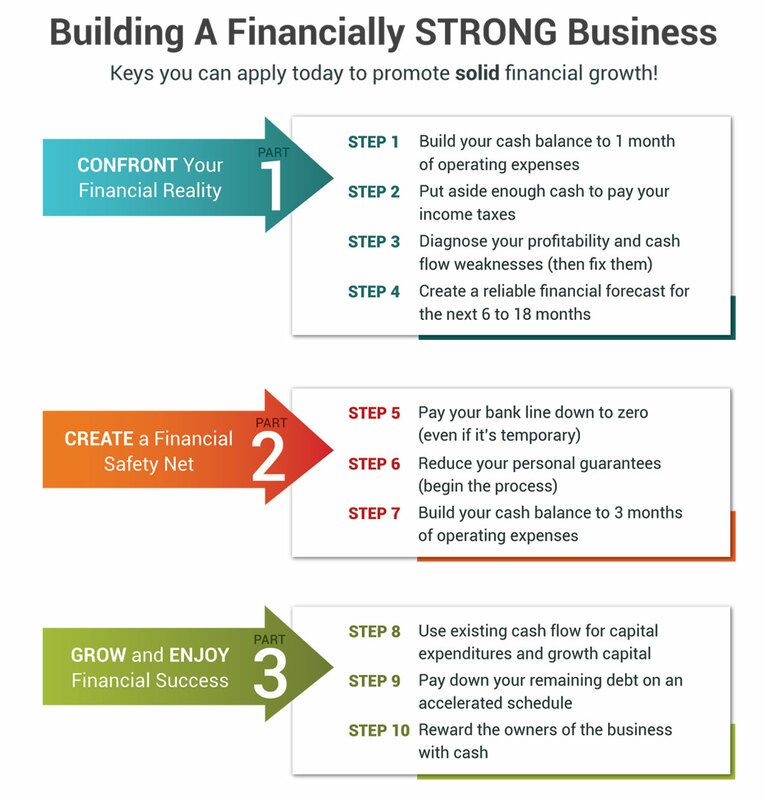 I have created a report that dives deeper into the 3-part plan and each of the 10 steps in the system for making your business stronger financially. And I am making it available at no cost as part of becoming a member of the Financial Rhythm Membership Group. Financial success in business can transform your life and the life of everyone who is counting on you financially. 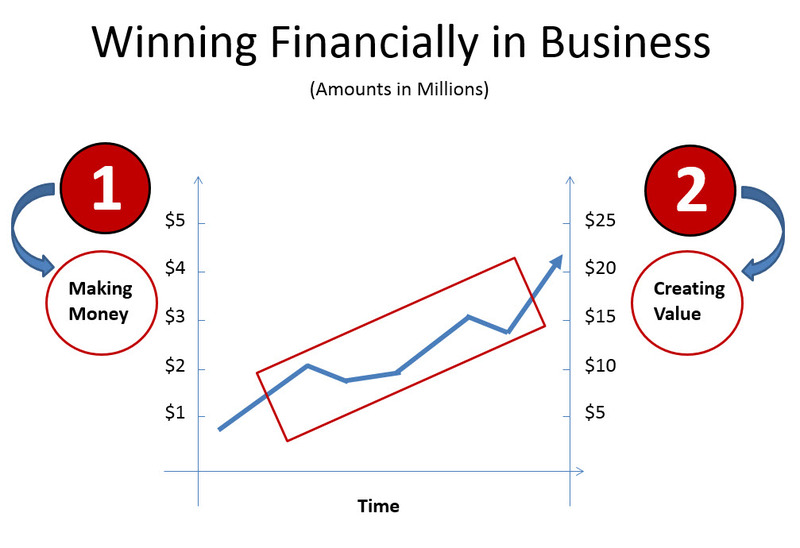 Winning financially is an important prize in business. But there’s no magic wand you can wave that will instantly create financial success. Winning financially in business is a journey. It’s about deciding what you are trying to create financially. Then creating a plan to get you there safely and on time. 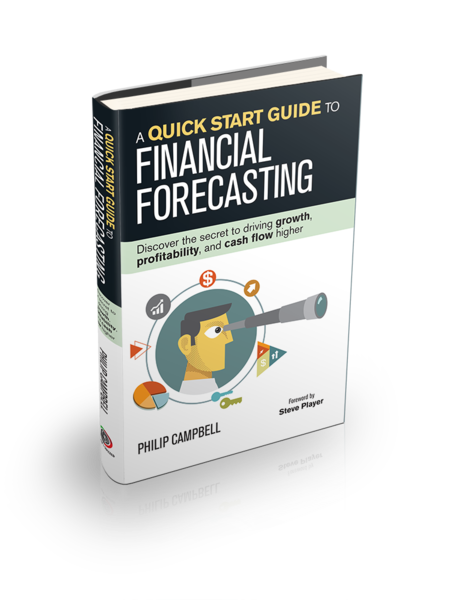 This free report provides you an achievable, 3-Part Plan you can begin implementing today. You will be surprised and delighted at the speed with which you see financial results and feel the benefits. You can sign up for the Free Membership and get instant access to my Free Report: A 3-Part Plan to Breathe Financial Life Back Into Your Business. 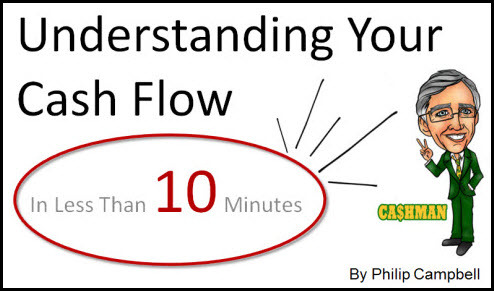 And for a limited time, you can download a free copy of my book Never Run Out of Cash: The 10 Cash Flow Rules You Can’t Afford to Ignore.